When I was a student I bought a little book called “Lived-in Architecture: Le Corbusier’s Pessac revisited” by Philippe Boudon. Published in 1969, it studied the 1920s housing estate that Le Corbusier built on the outskirts of Bordeaux to find out why it had been such a failure. This was based on the fact that practically every resident had changed the look of the starkly rational buildings. It’s a fascinating read and quite a hoot to see what the residents did with the reinforced concrete structures as they transformed them into traditional little houses with fake stone pillars, conventional windows and pitched roofs. So I was very pleased to visit the actual site earlier this year. It’s called the Quartiers Modernes Frugès (QMF) and was commissioned by the wealthy industrialist Henry Frugès who told the young architect to treat the place as an architectural laboratory. Le Corbusier had already built a set of 10 workers’ houses for Frugès in nearby Lège in 1920 (which have been similarly messed-about with) but Pessac was to be a proper new suburb with some 200 houses, all to be sold privately. About 50 were built and all remain in private hands apart from one which is owned by the local council and now used as a museum. It was an opportunity for Le Corbusier to put to the test his ideas about prefabrication and standardisation. the opening ceremony in 1926 – those hats! The Quartier was formally unveiled in 1926 by the Minister of Public Works, Anatole de Monzie (whose wife famously lived in Le Corbusier’s luxurious Villa Stein-de Monzie in Garches of the same period) although it wasn’t finished until the end of the decade. When you see a photograph of the opening and what everyone was wearing then you begin to realise how ultra-modern this development was. Back then, Pessac was little more than a village surrounded by vineyards and pine woodland but it is now a built-up suburb of the beautiful city of Bordeaux. The houses are familiar from Le Corbusier’s early Monol and Citrohan designs, with their strip windows and roof terraces, and each type of house is based on a standard cube. The ‘skyscraper’ style is the tallest, with three floors and a roof terrace that is accessed by a cantilevered external staircase. They are semi-detached, joined at the back, so that one faces one street, the other with a side entrance. A single detached version remains (another was destroyed when a bomb exploded on the nearby railway in the Second World War). Another set of houses is linked by graceful concrete arches which reminded me of Oscar Niemeyer’s fluid forms. And a low terrace of houses does a push-me-pull-you trick with every other house facing the street while its neighbour faces the street behind. It’s a curious idea but, according to Bourdon’s interviews with the residents, it supports a tremendous feeling of privacy, which was always important to Corb. It always sounded rather complicated to me which is why it’s important to visit these places and see the plan in action. Perhaps the most striking feature of the estate is the use of colour. Le Corbusier was a painter, of course, under his real name of Charles-Edouard Jeanneret, and he used a colour palette of blue, maroon, yellow, green and white for these buildings which reflect the natural tones of the landscape around them. It’s still quite a shock if you think of Le Corbusier’s buildings as being uniformly white, like his luxury villas in Paris such as the Villa Savoye. It was fantastic to be able to walk around the house that is conserved by the local council. wide windows – revolutionary at the time, all that light! But I was in for an even better treat. Later, as I took a photo of one house, a car drew up beside me and the driver popped out and asked me if I wanted to see inside. He had just bought it and was going to restore and then rent it out as holiday accommodation. “Where in the world can you holiday in a house designed by Le Corbusier?” he asked. “Nowhere but here!” The house he had just bought needed a lot of work but still had its original floors (local pine) and most windows. He proudly showed me the whole place, including the roof terrace. His enthusiasm was infectious and I was in my element, talking about my favourite architect. It’s so good to see that gradually all the houses are being restored to their original state. They feel remarkably contemporary and they show Corb’s preoccupation with creating homes that really work – after all, this is the same period as his Pavilion de l’Esprit Nouveau in Paris and the time when he coined the phrase ‘machine a habiter’ – a machine to live in – which people still bash him over the head with. At Pessac you can see modern homes that are light and private with heating and spacious living rooms and large gardens or roof terraces. I couldn’t help thinking of the Tudorbethan semi-detached houses that were about to swamp the new suburbs of Britain at this time. And yet the Bourdon book reveals how the ordinary people who bought these houses really wished that they looked conventional. After all, the suburb was mocked for looking like sugar cubes (because Frugès dealt in sugar) and called the Moroccan village (which was simple racism). The common style of house in the region is called a lean-to and directly facing the entrance to the QMF there’s a prime example built at the same time. Which would you prefer? The QMF is not without faults, and of course the houses leaked because building techniques simply hadn’t caught up, but judging by what I experienced that spring day, there is a strong feeling of community and I think there are still many lessons to learn from it in our contemporary urban planning. Boudon concludes that the fact that so many of the houses were modified showed how adaptable the designs were, which sounds too kind for my liking. They were simply ahead of their time and are now being re-evaluated and appreciated. Because most tellingly for me was the fact that I left thinking that I wanted to live in one of them. After all, isn’t that the mark of a successful design, when you want one for yourself? Okay! Okay! You are beginning to convert me to your passion. Reading this really interesting post, it struck me that this design had a touch of the Renaissance about it – many Italian Renaissance buildings also being based on the cube and also with arcades. It was about restraint, which I think also has a flavour of Corb. I love the idea of the buildings facing alternate ways – I could really imagine that working. You’re absolutely right! I think architects throughout history have always been drawn to the cube and the creation of balanced volumes – I think of the double cube of the Banqueting House in Whitehall by Inigo Jones. Interestingly, Corb was much influenced by the monastery at Ema outside Florence which he first visited when he left Switzerland for the first time in 1911 on his ‘voyage to the Orient’ (or Turkey…) – the sense of community and spaces for privacy and connection, which he brought into all his work. I love the arcaded ones and those French hats! I wonder if you had the choice out of all the houses Corb built which one you’d want to live in? It’s a great picture. Always knocks me out to see these clean, contemporary buildings next to cars with running boards and crank handles, too! I have my name on that detached house – it was simply luscious! I really enjoyed reading this post, I have discovered Le Corbusier’s buildings since moving back to Paris, and regret that in my 10 years spent in Bordeaux I didn’t make it to Pessac. I do remember however seeing one for sale when we lived there and dreaming about living in it! Maybe one day, I don’t think I’ll be moving into the Villa La Roche or any of the Parisian ones soon that’s for sure! Thanks for your comments, Siobhan, and welcome to my tiny corner of the blogosphere. I liked Bordeaux enormously and Pessac was more of a revelation that I’d expected, especialyl when everyone I met there was so friendly and welcoming. But it’s lovely to wander around the 16th arondissement in Paris and visit La Roche and also the Rue Mallet-Stevens. 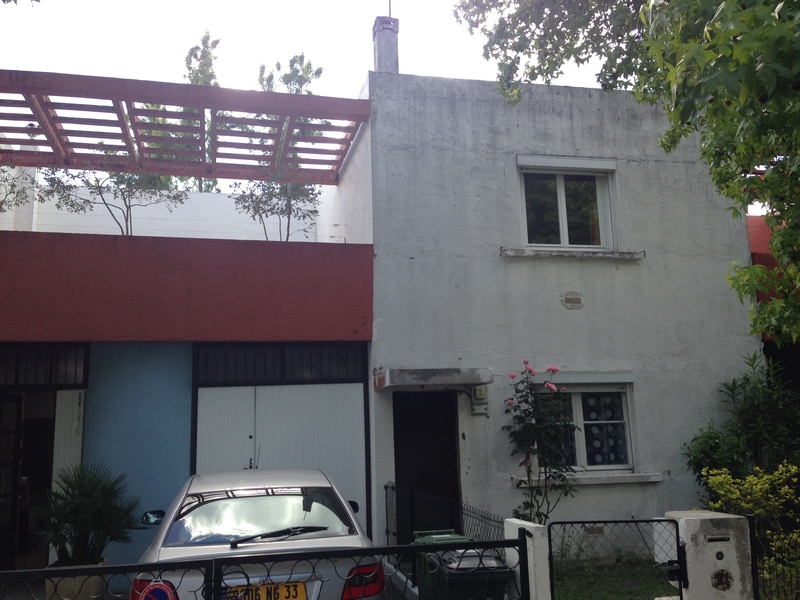 And then Le Corbusier’s own home in Boulogne-Billancourt is well worth a visit and then to stroll around the other wonders of the 1930s in the area. I’m sure you know it but the Museum of the Thirties next to Boulogne’s mairie is excellent. Ah, we can all dream!